I gave a talk last night at the Passenger Films/UCL Urban Labs screening of Tron in Bethnal Green, London. Some short films were also shown - Augmented City by Keiichi Matsuda, and two films by FactoryFifteen (check out both sites from some really innovative film making). 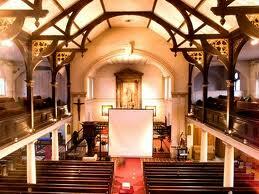 The films were shown in St John's, a working church, which was interesting in itself. The screen (larger than the one below) was strung between the pulpit and a statue of St Mary. Pews do not make comfortable cinema seats! Below are my notes about the films. Tron charts the attempt by a video arcade owner, Kevin Flynn, played by Jeff Bridges, to hack into ENCOM, the company he used to work for and whose boss stole his video programs. His attempts at hacking are blocked by ENCOM’s Master Control Program (MCP). One night, after breaking into ENCOM yet again, Flynn is forcibly pulled into the virtual world by the MCP. In the virtual world, programs (who are the doubles of their users) are subjugated by the MCP, who tries to get the programs to pledge their allegiance to the MCP and renounce their users. If they refuse to do so, they are forced into gladiatorial contests in a Game Grid until they de-rezz (die). 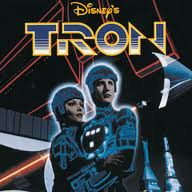 In order to defeat the MCP, Flynn must find and help TRON, a system security program. At its heart it’s a typical Disney movie of good against evil (or in the films terms blue against red). Tron pioneered the use of computer generated special effects and also provided influential representations of virtual space within computer networks. Visually it reminds me of Spectrum and Atari graphics mashed with Fritz Lang’s Metropolis, Star Wars’ Death Star and a bit of The Wizard of Oz (also in plot). Somewhat oddly, however, its landscapes are peculiarly empty - a massive grided space with singular bits, isolated programmes, and lacking in busy activity and millions of packets flying everywhere. (Not much it seemed happened in computer networks in 1982). It was made at a time when writers, artists and film makers were just starting to think about the form, meaning and social, political and economic consequences of everyday computing. It’s the nascent era of cyberpunk - William Gibson’s Neuromancer was published in 1984 - and Tron is Disney’s addition to the emerging genre - slightly dystopian but with a Disney ending where the people triumph and get their just rewards. And like cyberpunk, Tron opened up windows through which to explore a series of Cartesian dualisms that new, networked computing seemed to trouble: nature/technology; fixed/fluid; embodied/disembodied; real/virtual; public/private, as well as explore notions of artificial intelligence and power within new technological landscapes. Somewhat oddly, however, the world of 1s and 0s - inside the machine - is very Cartesian - built of Euclidean geometry and having the same spatial qualities as the geographic world - there are x, y, z coordinates, there is gravity, there is scale, there is distance (which cannot be jumped), there is linear time, there is materiality and death, there are distinct power geometries in terms of how the landscape is organized and governed. In fact the gridded world of the mainframe and network mirrors almost precisely the real world (even down to programs mirroring visually their users or creators), and yet it is distinctly separate from it. Throughout the movie there is a very clear division between ‘the world in the machine’ and ‘the real world’, though that starts to dissolve in the end frames as the city turns to neon, perhaps giving some inkling to a new world and era emerging. This thinking of the virtual in Cartesian terms extends well beyond Tron. Early virtual worlds and game-spaces are distinctly Euclidean in nature and mirror the spatial geometries and social norms of ‘real space’. Even domains that possess no spatial qualities are rendered so through spatialisations. In our book, Mapping Cyberspace, myself and Martin Dodge created a basic topology of the geometries of material and immaterial attributes in geographic and cyberspace and how they are visually rendered. Maps and spatialisations dominate. Such maps and spatialisations however are almost exclusively Euclidean in nature. The only variations are various forms of site maps such as file structures that used a graphing metaphor. It seems we find it difficult to imagine space other than Euclidean or scaled. The same kind of spatial imaginings are evident in Keiichi Matsuda’s Augmented City, where the various interfaces are projected into and arranged around body spaces - but how can it be otherwise? After all, these are virtual projections into geographic space. The same is also true of Factory 15’s videos, though they are more playful around notions of space and time, the geometries of form and matter, ideas of travel and the past. What Matsuda’s augmented reality videos do, unlike Tron, is two things. First, they bring the inside of the machine outside revealing their intermeshing rather than separation. Second, they illustrate the extent to which everyday life and spaces are now infused with software: the existing state of everyware wherein computation is available at any point on the planet - either through networks or embedded into objects; how the systems we engage with are thoroughly coded and the extent to which we are all software workers (in its broad sense, those that engage with software on a regular basis to perform tasks) and our lives shaped by code. And Factory Fifteen work projects everyware forward to envisage new space-time relations, especially with respect to notions of the past (and the effects of life-logging) and of place (and ideas of placelessness through abundant connections). In Tron, software is in the game arcade and in ENCOM. 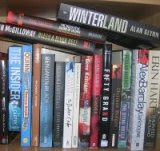 It has found a foothold in entertainment, business and government. Software workers are relatively small in number. Today, software is deeply and pervasively embedded into the systems and infrastructure of the urban and rural lives and in the management and governance of societies. Software-enabled technologies and services augment and facilitate how we understand and plan places, how we manage services and utilities, and how we live everyday lives. Software provides the core tools underpinning the use of technologies and infrastructures essential for the development of smart cities (smart buildings and environment, intelligent transport and utility systems, dense telematic and informatic infrastructures), is facilitating the generation and analysis of ‘big data’ (enormous, dynamic, interconnected datasets relating to people, objects, interactions, transactions and territories), and providing the tools and services of the knowledge society and economy. It’s not overstating the case to note that across a diverse set of everyday tasks – domestic chores, work, shopping, travelling, communicating, governing and policing – software makes a difference to how social, spatial and economic life takes place. Even systems that at first appear dumb - e.g., water system - software is at work. These coded entities transduce coded space and code/space - produce particular spatial relations and forms; software is necessary to bring space into being. If the code fails then the space is not produced as intended. To return to Tron from the present then, it is perhaps worth reflecting on two questions: what would it mean to be ‘in the machine’ when the machine is everyware and becoming inside out? And is there any way past the Cartesian imaginary? Shirley Jackson wrote: "No live organism can continue for long to exist sanely under conditions of absolute reality." Sometimes, when I'm out in a public place, I see people walking around, looking down at their phones, not seeing the other people around them, perhaps not seeing anything. If, by some chance, I am speaking to one of them and their phone chimes, they begin to ignore me and check the phone in a truly Pavlovian reaction. "I think, therefore I am." To be honest, I'm not so sure there's much thought these days. People seem to conduct their lives on autopilot. Whether or not we learned this from machines, or the machines learned it from us, is another question.